Comprehensive sheet; unique subjects; outstanding support material; sheet packed with markings. 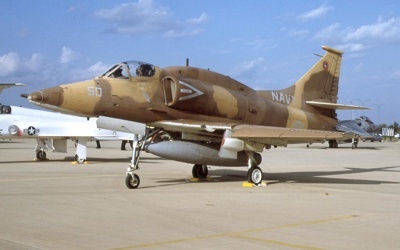 The next after market decal company out of the chocks with decals for the new Classic Airframes TA-4 Skyhawk is Fightertown Decals. I had ordered my decal sets direct from Fightertown back over the summer using the pre-order discount that got me both Skyhawk sheets for a small savings over the individual prices. It took a while for the decals to be completed and released, but it was worth the wait. Both of the new decal sheets from Fightertown Decals are devoted entirely to adversary Skyhawks. Unlike the release earlier this year from Afterburner Decals, Fightertown has chosen to include some single-seat aircraft in with all the two-seat aircraft. It is not a bad idea, making the sheets have appeal to modelers that do not care for the two-seat Skyhawk but want to build some cool adversary Skyhawks. I had a hand in the research of this decal sheet, so I had an idea on what to expect when the Fightertown package arrived in the mail. If I could take a quick moment to discuss colors. I do not think there is a more hotly debated subject in modeling than colors. Just when everyone final accepts some colors to be right on a given subject, someone surfaces to say "I was there, and that color was not what you think." Then, the whole debate starts over. the number of times the image was processed -- developed, printed, re-printed, copied, scanned, etc... Many of the images out there on adversary aircraft are third, fourth, and fifth generation images, scanned from books that were printed from copied slides. I am sure you get the idea. The people researching to make decal sheets like the ones reviewed here are human. They will look at all the images they can find. Then they will weigh the colors they see against the routinely used FS colors that the adversary units tended to use. Finally, they will come up with educated guesses as to the colors the aircraft were painted in. It is a less than perfect process. Keep all of this in mind before going off on a crusade to argue the merits of the color choices that any given researcher puts forth. The packages for these decal sets are the customary clear zip-lock baggies. Both packages are thick, having both the decals and three folded 8.5 x 11 inch full color instruction sheets. The register of the decals in my review samples was nearly perfect. 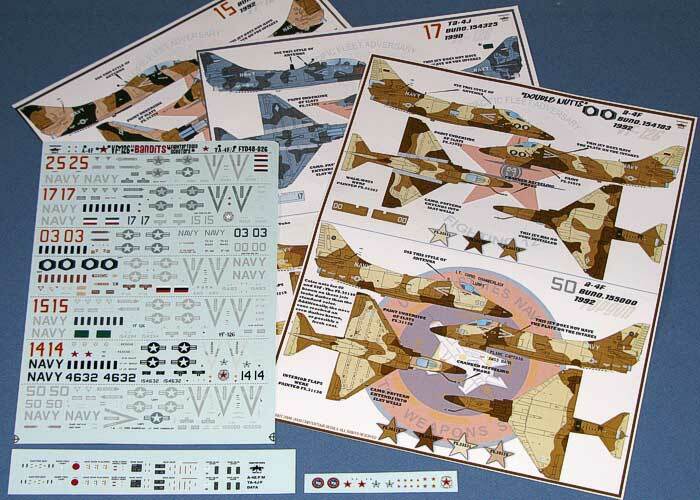 The instructions provide four-view diagrams of each aircraft, so you have everything you need to paint the models. To save some band-width in this posting, you can click this link to go to the Fightertown Decals home page, then follow the links to the 1/48th scale decals and the Skyhawk sheets near the bottom of the page. Fightertown has posted images of all the decal instruction pages on their web site. If you like the decals, you can even order the sheets right from there! In each package, the majority of the decals are printed onto a single sheet. Each package also has two small addendum sheets with extra tail badges, pilot helmet markings, ejection seat data markings, and landing gear strut markings. These are a really nice touch and will add significant interest to these areas of the completed model. 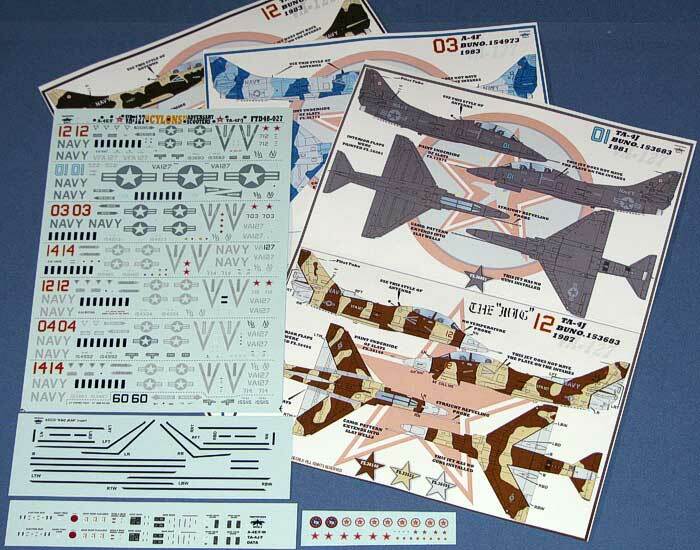 The FTD48-027 package has a third addendum sheet providing the cheat stripes for the MiG scheme TA-4J. The decals, themselves, are printed by Cartograf, which speaks volumes to their usability and quality. Very few of the aircraft covered by these sheets have markings in positive/negative colors, so the criticality of the decals matching exact paint colors is diminished. That said, the decal colors did line up well with the spot checking I made against my Federal Standard paint chip set. As I found out recently using some TwoBobs decals, being the right color on the decal paper does not guarantee the markings will be the right color on the model, but having the colors correct on the paper is at least a good start. Sheet FTD48-026 is devoted to VA-126. Sheet FTD48-027 is devoted to VA-127. Decal Sheet FTD48-026 - "Fightertown Scooters"
#1: A-4F(Super Fox) 154183, VA-126, 1992. "Double Nuts" is a military slang reference to the two zeros in the nose numbers of command aircraft in the Navy and Marines. This aircraft takes the term "Double Nuts" to a new high by actually painting two nuts (without bolts) on the nose to represent the zeros of the nose number. The aircraft is finished in a very attractive three-tone brown desert camouflage. As was common with the adversary community, the tail carries a fin flash representing an adversary's flag, in this case I believe it is a Soviet Nationalist flag. #2: A-4F(Super Fox) 155000, Topgun, 1992. This aircraft sports another attractive three-tone brown desert camouflage, however it has started to deteriorate with faded and touched-up spots in the paint. Also, the canopy appears to be a replacement from a different aircraft painted in a color different from the camouflage colors of this aircraft. An interesting side note on this aircraft is that it is an ex-Blue Angel. As such, the parabrake housing is still present under the tail. The adversary community seldom removed this housing, so its presence is a dead give away of a Skyhawk being an ex-Blue Angel. #3: A-4F(Super Fox) 155064, VA-126, 1992. I have a friend that will be crying in his beer over this one. He built this aircraft about ten years ago from the old Monogram Skyhawk kit. He and I worked hard to cobble together some kind of camouflage and markings. Now it is available here on this sheet. This aircraft is a very nice blue-gray mottled scheme with two grays and one blue. What my friend really liked about the scheme was the Iraqi flag on the tail. Considering the first Gulf War was recent history in 1992, it was a good choice for the fin flash on the aircraft. #4: A-4M 160045, Topgun, 1993. 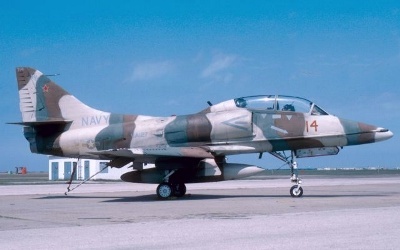 This aircraft is one of a small number (only four) A-4Ms to make it to Topgun for use as adversaries. 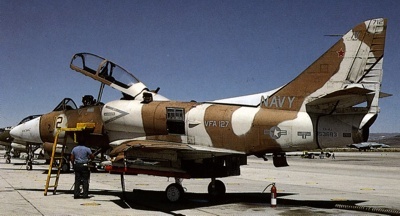 Four other A-4Ms also were sent to VA-126. 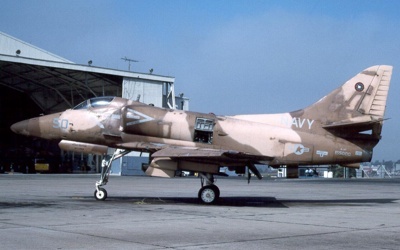 When Topgun got ahold of the aircraft, of course they camouflaged them just like any other adversary aircraft. 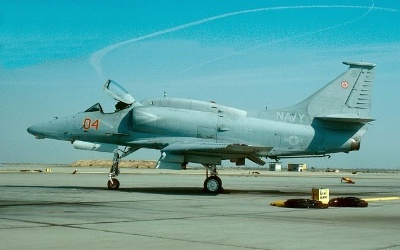 It makes these few A-4Ms unique among the ranks of all the A-4Ms. This particular machine was camouflaged in a three-tone brown desert scheme with a light gray bottom. #5: TA-4J 154313, VA-126, 1983. This aircraft provides a lesson on why photographs can not always be trusted. Compare the two images at the right. This is the same aircraft on two different days. You tell me which one is the right colors! The camouflage is a unique combination of two closely matching sand colors, broke up by a light green shade, and accented by a medium brown. This combination of colors gives a very unusual look to the aircraft, kind of like a bruised banana. I assisted Fightertown with this one to come up with some colors that seem plausible. In all honesty, though, this one could be one of the many examples of an aircraft painted in custom mixes of colors that may have no FS correlation. #6: TA-4J 154325, VA-126, 1990. This aircraft sports a two-tone gray camouflage. The instructions point out that it can be built with either one of two different adversary flags on it. The one shown here is, I believe, an Indian flag. The alternate is the solid green Libyan flag. #7: TA-4J 154334, VA-126, 1992. 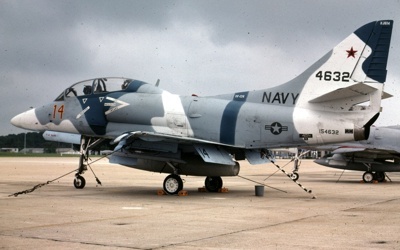 After a long and colorful career in VA-127, 154334 was passed to VA-126 who painted it into still another paint scheme. This aircraft has a three-tone desert camouflage with two tans and a dark green. A solid green Libyan flag is carried on the tail. Check out the next decal sheet FTD48-027 (below) for even more 154334 camouflage schemes. 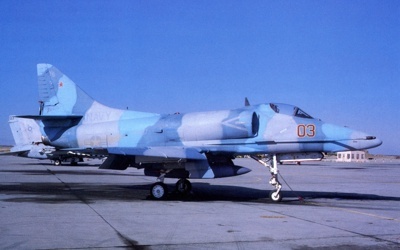 This aircraft ultimately was painted into the blue-gray scheme seen on the next aircraft, too. But, the decal sheet does not provide decals for that version or 154334. #8: TA-4J 154632, VA-126, 1993. This aircraft is painted in what is probably my all time favorite camouflage for adversary aircraft. 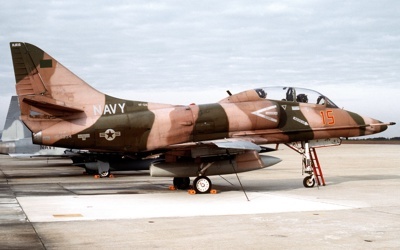 VA-126 painted most all their aircraft into this scheme right before they disbanded. It is an attractive combination of dark blue with medium blue-gray and light gray. The bottom is overall Air Superiority Blue. 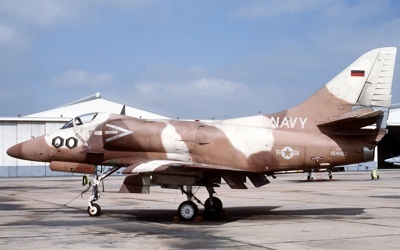 I am just finishing up an A-4M in these colors and it is beautiful. Of note here is that Fightertown got the data markings around the cockpit area printed in the correct color. They should be light gray to match the camouflage color. They also provide two different options for badges on the tail and the names painted on the cockpit and nose wheel door to match. It is always interesting to see how various decal companies fill"dead space" in their instructions. Some print a series of reference photos. Others print large blocks a historical text to better define the aircraft on the decal sheet. Still others will just leave a full side of one of the pages blank. The last page of this Fightertown decal sheet has a nicely printed diorama base to display your finished Skyhawk. It is printed to be a section of concrete hard stand, complete with yellow stripes, tie down points, oil spills, and grime. Attached to a piece of cardboard or wood and coated with a clear flat spray, it would make an effective display base. Kudos to Fightertown on providing a unique way to fill the last page in the instructions. 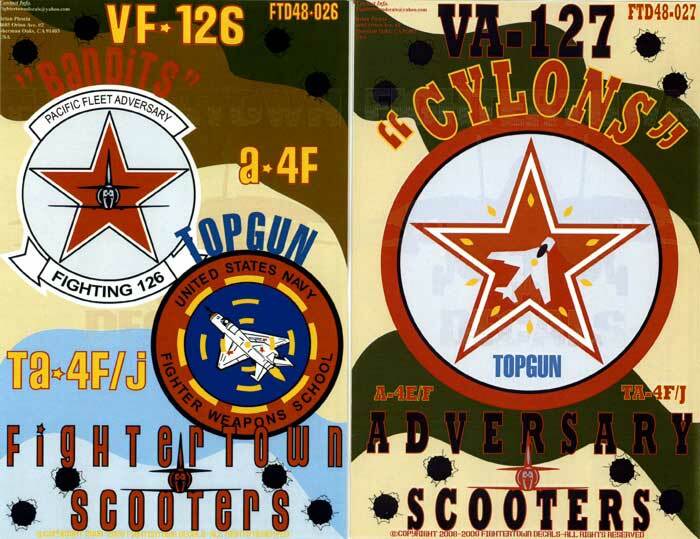 Decal Sheet FTD48-027 - "Adversary Scooters"
#1: A-4F(Super Fox) 154973, VA-127, 1983. 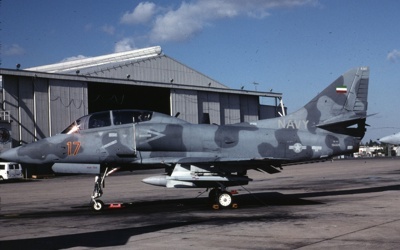 This aircraft sports a three-tone blue-gray camouflage. Of note about the airframe is that it has none of the RHAW antennae fairings either under the nose or around the engine exhaust. #2: A-4F(Super Fox) 154992, VA-127, 1984. This aircraft was a Blue Angel at some point in its career. Based on the aircraft still having its avionics hump and no parabrake housing under the tail, I would deduce that this scheme predates when the aircraft flew with the Angels. 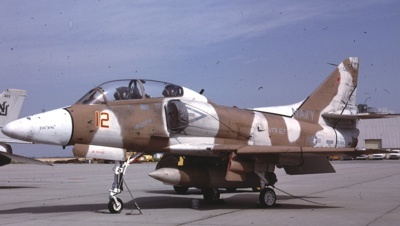 As presented on the decals, the aircraft is painted in the standard TPS for the Skyhawk. #3: TA-4J 153483, VA-127, 1983. This aircraft is an interesting three-tone desert camouflage using sand, brown, and dark gray. I have to admit that I like this color combination. #4: TA-4J 153683, VA-127, 1981. This aircraft is one of the earliest adversary schemes out there. The aircraft is painted overall Engine Gray with lighter gray markings. The only blemish with my review decals was with this aircraft. The light blue in the 01 for the nose is every so slightly off register. It is probably not enough to be a problem on the model, but there it is. #5: TA-4J 153683, VA-127, 1987. Take the last aircraft, jump forward in time six years, and you get this scheme. 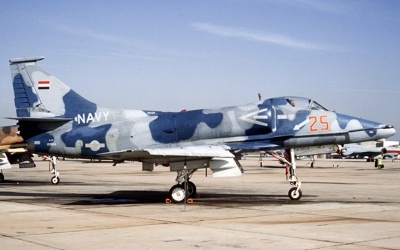 The US Navy flirted briefly with deceptive camouflages, applying the outline of a MiG-17 onto a couple Skyhawk aircraft to evaluate how well the aircraft could be disguised to be a MiG in flight. The testing proved ineffective. 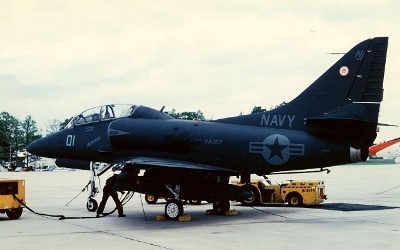 While the paint scheme worked in close quarters (inside a mile), beyond this distance the Skyhawk still looked like a Skyhawk. This version of the "The MiG" is the last one in a series of color changes for 153683. The original scheme had nose number 06 and was a simple brown silhouette painted on a gray aircraft. Next, they added black cheat lines to the edges of the silhouette. Then they added a sand camouflage to the brown silhouette. All these versions used positive/negative brown markings. This final version as presented on the decal sheet changed the nose number to 12 and changed all the markings to medium gray. #6: TA-4J 154334, VA-127, 1983. #7: TA-4J 154334, VA-127, 1984. #8: TA-4J 154334, VA-127, 1985. As mentioned in the decal instructions, this aircraft changed camouflages so much that it gained the name "Chameleon". This sheet provides three version from 1983, 1984, and 1985. The first two are sand and dark green schemes. The last one is the same as the second one, only they applied a brown color to the aircraft. All three versions use the same decals from the decal sheet. #9: TA-4J 155115, Topgun, 1993. 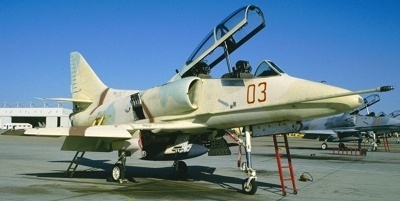 #10: TA-4J 155115, Topgun, Date Unknown. This aircraft has two versions, as mentioned in the instructions. Both use the same decals from the decal sheet. The first is a standard TPS scheme. Based on this image, it was rather ratty looking with faded and touched-up spots. It looks like they cleaned up the airframe for the second version, in the process replacing the L.Ghost Gray on the tail with the same light gray as found on the bottom of the aircraft. In fact, I am not convinced there is any L.Ghost paint left on the second version. It appears they may have extended the D.Ghost all the way down to where it meets the bottom color. The instructions point to the varied antennae on this aircraft, but the drawing is not clear exactly what they are pointing at with regard to the tail. Note this aircraft has ILS blade antennae on the sides of the tail. #11: TA-4J 158465, VA-127, 1986. This aircraft is a pleasing blue-gray stripe scheme and has a name of "The Saint" painted on the left side of the nose. I did not realize it, but apparently there was a period with VA-127 where they named most of their aircraft. This is the third aircraft on this decal sheet to have a name, all printed in the same Old English type face and all applied to the same access panel on the left side of the nose. Since this decal sheet provides more aircraft than the previous sheet, there was no "dead space" in the instructions. 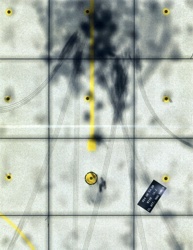 Hence, there is no printed diorama base provide with this decal sheet. These are a couple of great decal sheets with lots of colorful camouflage options to use on the new Classic Airframes TA-4 Skyhawk kits. It also includes a few single-seat aircraft in the mix for those not wanting to build a two-seater.